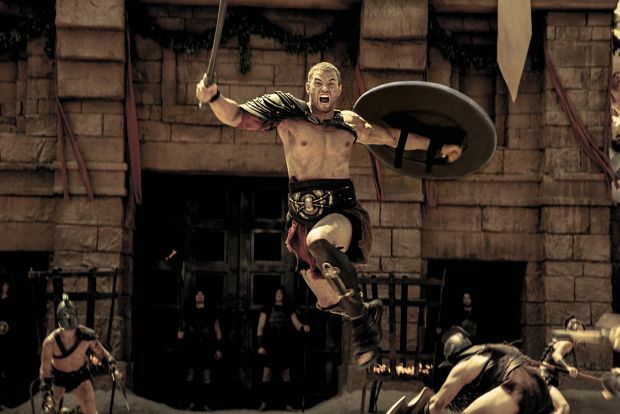 NEW YORK (CNS) — An embarrassingly weak film about the personification of strength, the 3-D action adventure “The Legend of Hercules” (Summit) is nothing short of woeful. Adult viewers may be too distracted by the film’s aesthetic shortcomings to notice the mostly innocuous nature of its vulgarity-free script on which director Renny Harlin collaborated with three others: Daniel Giat, Sean Hood and Giulio Steve. Co-starring with his own pectoral muscles, Kellan Lutz, veteran of the “Twilight” franchise, takes on the title role. But first we get the background story: Tired of her power-hungry husband, King Amphitryon’s (Scott Adkins) warlike ways, Queen Alcmene (Roxanne McKee) of the Greek city-state Tiryns prayed to the goddess Hera for peace. Through a priestess, Hera responded to Alcmene’s plea by granting her permission to sleep with Zeus, Hera’s own hubby, so that the pair could conceive a hero who would deliver the realm from Amphitryon’s tyranny. Cut to Alcmene rolling around on her bed as thunder rumbles in the background, and nine months later, along comes baby Hercules. Once grown and buff, Hercules falls for fetching foreign royalty in the person of Princess Hebe (Gaia Weiss). But mean old Amphitryon — who knows that Hercules is not his son, though he’s unaware of the lad’s divine paternity — has other plans. Namely, to contract a purely political marriage between Hebe and his heir, Hercules’ cowardly half-brother Prince Iphicles (Liam Garrigan). Hebe, who knows a craven black hat when she sees one, doesn’t like the idea one bit. The better to get Hercules out of the way, Amphitryon sends him on a doomed military expedition. But, as the old saying goes, you can’t keep a good future deity down. So, despite such travails as being enslaved, branded and forced to fight as a gladiator, we know it’s only a matter of time till Hercules makes a triumphant comeback. Along the way, vaguely drawn and passing parallels are made between Hercules and Jesus. Thus the people of Tiryns repeatedly hail Hercules as their savior, and a climactic scene finds him offering his own life for those of his comrades while hanging in chains in roughly the posture of Christ on the cross. While not offensive to Christian sensibilities, these sketchy allusions are as ineptly handled as every other element in Harlin’s lump of mythological lead. The dialogue displays a firm grasp of the obvious, falling flower petals signal that it’s time for Hercules and Hebe to go all the way, while rain falls in sheets whenever a battle commences. As for the performances, they’re uniformly as wooden as that horse the Greeks gave the Trojans. The film contains considerable but bloodless combat violence, a suicide, implied premarital sexual activity, scenes of sensuality and mature references. The Catholic News Service classification is A-III — adults. The Motion Picture Association of America rating is PG-13 — parents strongly cautioned. Some material may be inappropriate for children under 13.